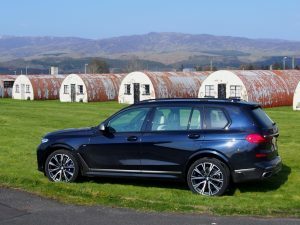 Having spent the afternoon at Gleneagles on Sunday for the finish of the magnificent Flying Scotsman Rally, it was back to Gleneagles again on Monday for the Press launch of BMW’s new flagship, the X7. By goad it’s big. Fit for a President or a rock star. It’s just over 5 metres long and 2 metres wide, that’s longer and wider than a Transit so you have to bear that in mind when traversing British roads or looking for a car parking space. 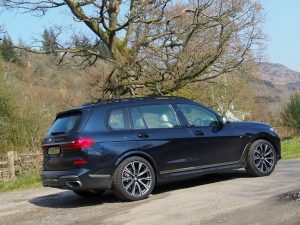 The X7 completes the BMW ‘X’ range line-up starting with the compact X1 and they have gone to town with the new car. Starting price for the 50d is £85,000 but the test car had 23 grandsworth of extras. That pitched the finished article well into the luxury limousine sector. 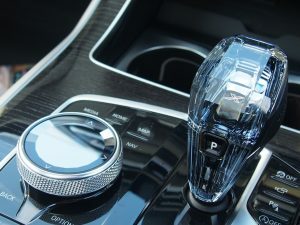 Just about everything in this car is impressive, not just its physical presence, but the attention to detail, although the jewelled cut glass gear-shift control knob was just a bit too bling for my taste. As for ‘connectivity’ it takes phone and internet linking to a new level with voice actuated functions plus the fact you can download ‘widgets’ to the command console and add even more stuff. The number of options and functions is quite bewildering and it might just persuade even the most arrogant of ”you can’t teach me anything” men to reach for the Handbook to reveal and expand on the car’s complexities! Standard equipment includes BMW’s Intelligent Personal Assistant, a digital helper that responds to the prompt “Hey BMW”. Updates to this system will be continuous and can be made on a smartphone and in-car via the Remote Software Upgrade functionality allowing drivers to be increasingly able to operate their car, access its functions and obtain information simply by speaking to it. One dreads to think what the weans will make if it! Whatever, this Intelligent Personal Assistant will learn routines and the driver’s preferences such as seat heating settings or the places they navigate to frequently (“Take me home”). Unlike other systems, the driver can give the assistant a name, and it can even provide casual conversation. Saying “Hey BMW, I’m cold” will prompt the hidden helper to adjust the temperature inside the car accordingly. As for the intelligent bit, he assistant gets better with every command given, every question asked and every setting made. For instance, “Hey BMW, I feel tired” triggers a programme that adjusts the lighting mood, music and temperature to make the driver feel more awake. The mind boggles. On the other hand it is simple to drive. Fire it up, select ‘Drive’ and go. And boy does it go. This is where the BoGoF factor comes in. If you buy this 6/7 seater luxury limousine you get a free sports car with it. It just happens to be the same machine, but if you go and swipe the driving functions to ‘Sport’ mode, then Sport Plus and Sport Dynamique you can transformer the cruise liner into a Riva-esque speed boat. 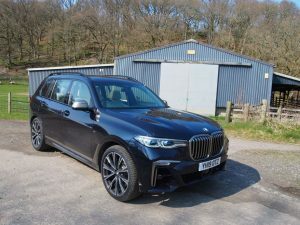 In the ‘Comfort’ setting, the 3 litre engine is as docile as a ride-on lawnmower, but the 50d has been weaponised by the addition of four, yes four, turbochargers. This lifts the power output from 265 hp on the 30d to 400 hp in the 50d model’s ‘Sport’ setting. Selection of the sport mode also revealed one of the greatest pleasures of the car, the sonorous song of a straight six, but not just any old straight six, this is BMW’s finest, fitted with two big turbos and two smaller ones. When I asked if I could look under the bonnet to see how the engine had been packaged I was told there was no point as all you could see was a lot of plastic and a dipstick to check the oil. Pity that, this engine is a triumph. In fact the only improvement that could be made was an open exhaust or at the very least, an active exhaust so that the driver and passengers could indulge themselves when the fancy took them! Every time I drive a V8 I think there is nothing to beat the noise, then when again re-united with a straight six I think there is nothing to beat the sound of that instead. Such fickle allegiances, eh? Sad, but that makes me dread the imminent arrival of electric vehicles silently cluttering up our roads. As it was the straight six engine was discernible, but only just, more’s the pity, although given the likely customers that this car will be aimed at, the last thing they will want is any sort of ‘noise’ from under the bonnet. Some folk just have no appreciation of the finer mechanical things in life, eh? Somehow I don’t think the current Mayor of London would appreciate it. 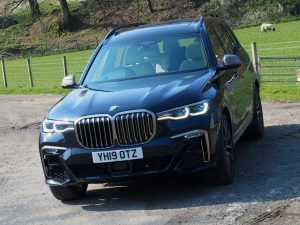 Classed as an SUV, the car weighs just shy of two and half tonnes and yet it thinks it’s a Z4 at times. It can sprint from rest in an exhilarating rush to 62mph in under 6 seconds while the top speed is quite simply academic. This is a genuine 7 seater with decent room in the third row for two average sized adults although getting in and out will still require some physical dexterity. That means you won’t be able to shut your granny in the back row and forget about her, because it is highly unlikely she’ll be able to climb in the back. On the other hand it could be a six seater as BMW offers the option of two ‘captain’s chairs’ in the middle row, just like the front seats, as opposed to the standard three seat row. The suspension system has an adjustable 80mm of travel whether you need it lowered for sport or raised for rock climbing with all the comfort modes in between. Perhaps I could leave the final words to my car sharing colleague, the inestimable motoring correspondent of ‘The Scottish Farmer’ newspaper, one Ken Fletcher Esq who was heard to mutter: “You know what, I might just give up my Range Rover for one of these”, then he thought of the towing capacity. It would appear that the towing capacity of this machine is a mere unexpected and disappointing 2.6 tonnes. We did ask the BMW staff if this was correct and they confirmed it was, so maybe there’s more to come on the matter. That might also affect those of us involved in motorsport. 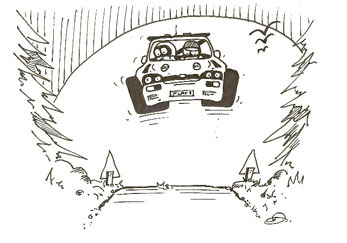 A heavy covered trailer and a historic rally car plus wheels and spares might just cause a major re-think of one’s choice of towing vehicle. Still, if they fit an active exhaust, I could live with that!